RadioDNS was today awarded a 2010 Radio World “Cool Stuff” Award. RadioDNS was selected by the magazine’s panel of veteran broadcast engineers as notable for its potential in serving radio broadcast users. Radio World’s “Cool Stuff” Award-winning products, announced by U.S. Editor in Chief Paul J. McLane, are selected each year by a panel of radio broadcast engineers as notable for their design, features, cost efficiency and performance in serving radio broadcast users. The winners will be featured in the June 2 issue of Radio World, which is read by radio professionals throughout the US and internationally. 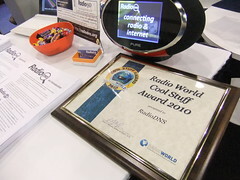 The award, pictured above on the RadioDNS stand, marks the end of a successful appearance at the 2010 NAB Show, where RadioDNS technology has been displayed and demonstrated to a large number of broadcast professionals and consumer electronics manufacturers. RadioDNS was also showcased in the ‘Daily News’ show publication. Radio World (www.radioworld.com) is the definitive information resource for radio managers and engineers, covering technology, industry news, management techniques, applications-oriented engineering, production articles and new product information. Radio World is published by NewBay Media LLC, the world’s leading publisher of pro broadcast, audio and video publications. RadioDNS (radiodns.wpengine.com) connects broadcast radio transmissions to resources on the internet: enhancing radio by using the benefits of hybrid IP-connected receivers. An open project, RadioDNS is a not-for-profit organisation based in Geneva, Switzerland.